The U.S. Department of Defense has made a bold move to support a North American rare earth element project, and it's made waves in the market. In this exclusive interview with The Critical Metals Report, Jeb Handwerger, editor of Gold Stock Trades, explains what this means for investors and what companies may be the sector's next big success stories. The Critical Metals Report: Jeb, the US Department of Defense (DoD) recently took the unusual step of contracting with Ucore Rare Metals Inc. (UCU:TSX.V; UURAF:OTCQX) to conduct a mineralogical and metallurgical study on the company's Bokan Mountain heavy rare earth element (HREE) property in Southern Alaska. Tell our readers why that matters. Jeb Handwerger: It matters because the DoD is now a huge potential partner for Ucore. After researching and studying all domestic rare earth element (Ree) assets, it identified the company's Bokan Mountain project as the key HREE resource. It put a stamp of approval and credibility on Ucore as the primary resource for its domestic supply chain. What this means for UCU investors is obvious. It can be seen in Ucore's stock price and volume and the way that it's performing against all other Ree miners, recently hitting new 52-week highs on very strong volume. This at a time when the Market Vectors Rare Earth/Strategic Metals Exchange-Traded Fund (REMX:NYSE.A) and many of the other larger Ree miners are hitting 52-week lows (see chart below). The stock action is a huge testament to the value and credibility of what the Ucore management team has done to develop the Bokan property so far. By the way, the DoD could eventually become an ideal offtake partner for Ucore. TCMR: Interesting. 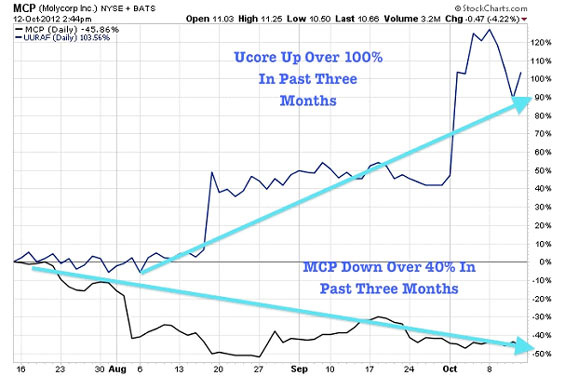 Is any money changing hands in this deal between the DoD and Ucore or is it just a study? JH: Right now, it's at the initial stage. But we believe it could turn into something significant, a substantial financial commitment. In my last TCMR interview, I spoke about the importance, when studying the Ree sector, of looking at possible geopolitical support in a mining jurisdiction that could provide financial backing. We're seeing that in this case, the advantage a company has when it gets a partner like the DoD. The DoD's support could really help fast-track Ucore into production of not only Ree concentrate but also being able to separate individual rare earth oxides (REEOs). These are needed for weapons, such as the Stealth helicopters and guided missiles.